Dr. Marc DeHart is our Doctor of the Week. He is a specialist in the surgical treatment of arthritis of the hip and knee, but also enjoys general orthopedic surgery and sports medicine. Dr. DeHart holds a Certificate of Added Qualification in Sports Medicine. Dr. DeHart completed his Orthopaedic Residency at the Wilford Hall USAF Medical Center in San Antonio, Texas. While on active duty with the United States Air Force, Dr. DeHart served as a F-16 Flight Surgeon for the 69th Tactical Fighter Squadron. Dr. DeHart is an Assistant Professor for the University of Texas Medical Branch. He is the first orthopedic surgeon from the Austin, TX area to be inducted into the American Orthopaedic Association. 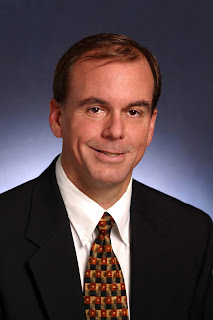 Dr. Marc Dehart is our Doctor of the Week! Watch the video to learn more about Dr. Dehart. 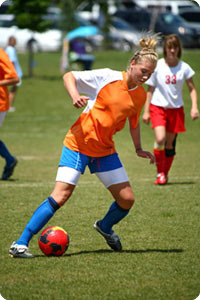 Until a child's bones have fully matured (in girls, typically by age 14; in boys, age 16), an injury to the anterior cruciate ligament (ACL) - the primary, stabilizing ligament of the knee joint - requires special consideration, treatment and care to ensure appropriate healing and to prevent long-tern complications. According to a review articles in the February 2013 issue issue of the Journal of the American Academy of Orthopaedic Surgeons, ACL injuries once were considered rare in children and adolescents. However, the number of ACL injuries in young athletes is on the rise, "whether they result from year-found training, less free play or increased single sport concentration," said study author and pediatric orthopaedic surgeon Jeremy Frank, MD. To avoid potential future complications, such as early onset osteoarthritis, the literature review outlines the optimal strategies for treating pediatric ACL injuries based on the specifics of the injury and the child's bone, age and developmental maturity. One recommendation includes postoperative management including weight-bearing and activity modifications, bracing, and a progressive physical therapy program emphasizing range of motion, closed-chain strengthening (exercises on the knee while the foot remains stationary) and a gradual and measured return to sport-specific maneuvers and activities. "There are currently numerous safe and effective surgical techniques to reconstruct the ACL in the skeletally immature sportsperson to restore stability and forestall the early progression towards meniscal and cartilage disease," said Dr. Frank. Complications from ACL surgery are rare in children when the appropriate operation is performed and the right patient. 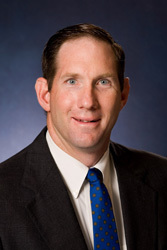 Dr. Robert Foster is one of Texas Orthopedics two fellowship trained hand surgeons. He specializes in minimally invasive carpal tunnel surgery, complex hand reconstruction surgery, sports injuries, total joint replacement, and orthopedic trauma treatment. Want to learn more about carpal tunnel syndrome? Read Dr. Foster's article here! Dr. Robert Foster is our Doctor of the Week. Watch the video to learn more about Dr. Foster! Scott A. Smith, MD is a board certified orthopedic surgeon and is sub-specialty certified in sports medicine. He has a special interest in comprehensive arthritis management, the care of fractures, and osteoporosis. Dr. Smith is distinguished as a Fellow of the American Academy of Orthopedic Surgeons. Read Dr. Smith's sports medicine statement below to learn more about his sports medicine practice. medicine doctor, but I don’t think it’s the certificate that makes me a sports doc. football, volleyball, basketball, and baseball games. I love athletes and sports at all levels. have even been upright on a wakeboard (not for long). practice and life experiences qualify. Dr. Scott Smith is our Doctor of the Week. Watch the video to learn more about Dr. Smith. 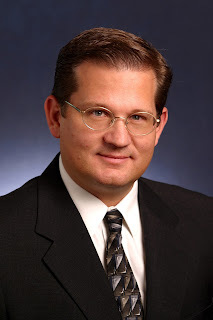 Dr. Richard Lutz is our Doctor of the Week! Watch the video to learn more about Dr. Lutz and spine surgery. Overuse injuries can affect muscles, ligaments, tendons, bones, and growth plates. In children, these structures are still growing, and the growth is generally uneven. Bones grow first, which pulls at tight muscles and tendons. This uneven growth pattern makes younger athletes more susceptible to muscle, tendon, and growth plate injuries. Below are some common overuse injuries seen in children. In Osgood-Schlatter disease, children have pain at the front of the knee due to inflammation of the growth plate at the upper end of the tibia (shinbone). This growth plate (known as the tibial tubercle) is a bump near the top of the tibia where the tendon from the kneecap (patellar tendon) attaches to the bone. 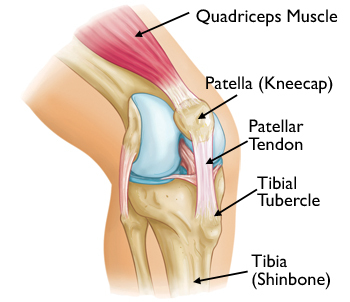 Osgood-Schlatter disease can cause inflammation and pain at the tibial tubercle - the place where the patellar tendon attaches to the tibia (shinbone). When a child is active, the quadriceps muscles of the thigh pull on the patellar tendon which in turn, pulls on the tibial tubercle. In some children, this repetitive traction on the tubercle leads to inflammation, swelling, and tenderness. The prominence, or bump, of the tibial tubercle may become very pronounced. Painful symptoms are often brought on by running, jumping, and other sports-related activities. Treatment of Osgood-Schlatter disease focuses on limiting exercise activity until the pain resolves. Immobilization. If the pain is severe and interferes with walking and normal daily activities, a cast or cast brace may be applied to completely rest the knee area. Most symptoms will completely disappear when a child completes the adolescent growth spurt, around age 14 for girls and age 16 for boys. However, the prominence of the tubercle will persist. Until a child is fully grown, however, Osgood-Schlatter disease can lead to more severe problems if it is not allowed to heal. Continued stress on the tibial tubercle from athletic activity could potentially lead to a break in the tubercle bone. Treatment for this type of fracture will require casting or even surgery. In order for the fracture to safely heal, a child will not be allowed to participate in sports for a prolonged period of time. Jumper's knee refers to pain that occurs in the lower portion of the kneecap (patella). These painful symptoms can range from mild to severe. 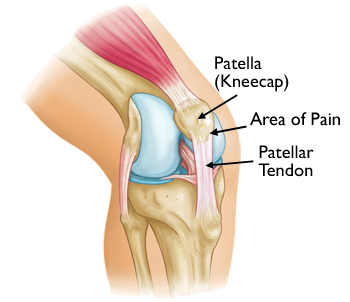 Jumper's knee symptoms occur where the patellar tendon attaches to the patella. Repetitive contraction of the quadriceps muscles in the thigh can stress the patellar tendon where it attaches to the kneecap, causing inflammation and tissue damage (this condition is also known as patellar tendinitis). In growing children, the patellar tendon attaches to the growth plate of the kneecap, and repetitive stress on the tendon can irritate and injure the growth plate. This condition is referred to as Sinding-Larsen-Johansson disease. Although these types of problems in the kneecap commonly occur in children who are active in sports that involve jumping, such as basketball and volleyball, they can be seen in almost any sport. Whether the problem stems from the tendon or growth plate, a child will need to rest from sports activities until the pain resolves. In addition to rest, your doctor may recommend applying an ice pack to the knee every 2 to 3 hours for a few days until the pain starts to go away. Non-steroidal anti-inflammatory medications may also help to relieve painful symptoms. Like Osgood-Schlatter disease, Jumper's knee can result in a fracture if a child continues to participate in sports activity without adequate rest. A fracture at the lower end of the kneecap will require treatment with casting or surgery, depending upon the type of fracture. The recovery time for a fracture of the patella requires prolonged absence from sports. A child's elbow can be injured from repetitive overhand throwing, as seen with pitching in baseball. Although throwing injuries in the elbow most commonly occur in pitchers, they can be seen in any child who participates in repetitive overhand throwing. The overhand throw creates stresses on the growth areas of the immature elbow. If overdone, overhand throwing may result in excessive inflammation of structures in the elbow, such as ligaments, cartilage, and growth plates. The growth areas of a young athlete's elbow are vulnerable to overuse injury. This illustration shows the elbow from the front, with the arm straight and palm forward. The growth areas of an immature elbow are highlighted in blue. Medial apophysitis. One of the most common elbow problems in active children is medial apophysitis, often referred to as "Little Leaguer's elbow." 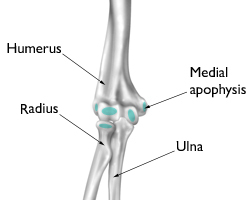 Medial apophysitis causes pain at the bony bump on the inside of the elbow. The bump, called the medial epicondyle, is at the end of the humerus bone and contains a growth plate called the medial apophysis. Muscles that control wrist motion attach to the medial epicondyle, and excessive overhand throwing can irritate and inflame the growth plate. Osteochondritis dissecans. A common source of pain at the outside of the elbow in active children is osteochondritis dissecans. Excessive overhand throwing can compress the immature bones of the elbow joint, causing small pieces of cartilage and bone to loosen and float inside the joint. As with all overuse injuries, the key to pain relief is resting from the sport. If pain continues after a few days of complete rest, seek medical treatment. If left untreated, throwing injuries in the elbow can become complicated conditions. Depending upon the severity of a child's injury, surgery may be required.